Imagine yourself back on the 18 December 2004, a fortnight before the UK’s Freedom of Information Act comes into force. It comes to light that the Cabinet Office, at the very heart of Government, is planning to have all emails that are over 90 days old deleted from their email servers. In other words they are deleting about ten years worth of correspondence – a portion of which will have been captured elsewhere, but much of which will only have existed on those email servers. The opposition leader has raised objections. Why did archivists and records managers not raise this as an issue? We did not know what to do with email accounts. We did not know how we would manage them over time, how we would deal with the personal data within them, how we would sensitivity review them, what retention rules we could apply to them, nor how we would appraise them as being worthy or unworthy of permanent preservation. We could not envisage how or when we could make available to the public an email account selected for permanent preservation. Records management in the UK had a great year in 2004, mainly thanks to the Blair government. During 2004 central government threw money at electronic records management systems, created lots of new records management posts, employed lots of records management consultants. It was exciting. We were not in a mood to question things too closely. On December 18 2004 we were all so focused on the coming of FOI (and perhaps the coming of the Christmas holiday) that we didn’t notice. I don’t remember even seeing this article, I can’t remember anyone mentioning it to me. 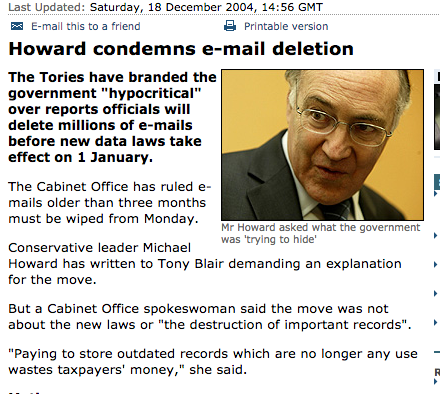 Was the mass deletion of Cabinet Office emails from email servers in December 2004 carried out for political advantage, administrative expediency or for recordkeeping improvement? Has the Cabinet Office continued that 90 day auto-deletion policy under successive Labour, Coalition and Conservative administrations for political, administrative or recordkeeping reasons? How serious is the impact of these deletions on the historical record? Is the important correspondence largely captured elsewhere? Or is this 90 day auto-deletion of email by one of the most important Whitehall Departments going to create a significant and irreplaceable gap in our nation’s historical record? Are we as a profession – records managers and archivists – any better equipped to manage email accounts over time now than we were back in 2004? Is there a feasible alternative to auto-deletion? Should the UK National Archives follow the example of its counterpart in the US and step in to prevent the auto-deletion of significant email accounts by declaring that it requires UK Government departments to select the email accounts of important civil servants for permanent preservation? Pickard, Jim and Stacey, Kiran 16 June , 2015 8:17 pm Freedom of information is Mission Impossible for Downing St emails. Financial Times, , available from http://on.ft.com/1QCbS8a (it requires a log-in). Accessed 17 June 2015 OR see see Morris, Nigel 17 June 2015. Government faces call to review self destruct email policy http://www.independent.co.uk/news/uk/politics/government-faces-call-to-review-selfdestruct-email-policy-10327202.html (accessed 20 June 2015). BBC News, 18 December 2004, 14:56 GMT. Howard condemns email deletion. Available at http://news.bbc.co.uk/1/hi/uk_politics/4107563.stm (accessed 20 June 2015). The Financial Times  reported this week that the Cabinet Office auto-deletes their e-mails after 90 days. A special advisor is quoted as saying that ‘It means that people don’t remember things…It is dysfunctional. Then they check their emails and they don’t exist anymore’. An aide is quoting as expressing their frustration that colleagues often had different recollections of what had been agreed at meetings. In 2004 many Whitehall departments were introducing electronic records management (ERM) systems, into which they told staff to capture significant documents and correspondence. The UK National Archives advice was at the time (and still is now)  that Departments should capture significant correspondence into a designated records system and should routinely delete correspondence from e-mail accounts. The UK government was the first administration in the English speaking world to implement ERM systems on a large scale. If felt like an experiment at the time – powered by the Blair government’s modernising government agenda, the coming of FOI in England and Wales (and separately in Scotland), and by the fact that paper records systems had been blown apart by the coming of email in the mid 1990s. just because archivists and records managers in the UK government sector and elsewhere recommended the routine deletion of email from email accounts in good faith, back in 2004, whilst embarking out on the electronic records management system journey , and in the hope and on the assumption that the policy instruction to save significant emails into electronic records management systems would be followed…. …..does not mean that we should continue to recommend or support such routine deletions now, in 2015, in the light of the experience that we have gained in the intervening decade. The experience we have had in the UK, in continental Europe, in Australia and in the US is that asking colleagues to choose which of their e-mails are significant, declare them as a record, and move them to some sort of electronic file (or paper file, or SharePoint document library) does not capture an even vaguely adequate record of correspondence. It is interesting to read the quotes of the special advisors/aides/officials in the FT article. One presumes that some emails have been captured into the Cabinet Office’s ERM system (for nearly a decade they had a system provided by Meridio, but have recently replaced it with Google Docs). And yet the officials quoted by the FT talk as though there was no correspondence record at all. My guess is that this is because individuals saved so little correspondence into the system, and saved into the system so selectively, that to all intents and purposes there was and is no Cabinet correspondence record outside of e-mail accounts. how many e-mails did Cabinet Office staff send in any given year? how many e-mails were captured into the Cabinet Office record system in that same year? We do have these figures for the US State Department, thanks to a report  published by the Office of Inspector General in March 2015. The report states that in 2009 the State Department implemented a record system that was built into the Outlook email client, whereby individuals could declare important emails as records. This was backed up by a policy instruction that individuals were responsible for preserving important emails as records, and by training. The Office of Inspector General’s report sates that in 2011 the State Department sent 1 billion emails, but only 61,556 were declared as records. Robert Smallwood  calculates that the emails captured into the State Department’s record system constitute only .0061% of their total email communications. In 2013 the situation was even worse – only 41,749 State Department emails were declared as records. Interestingly the report states that one of the reasons for the lack of the declaration of emails as records was a fear that they would show up in searches (which I am interpreting to mean that they would show up in searches conducted in response to Freedom of Information requests). If the Cabinet Office no longer knows how many emails it received in a given year then the headcount of the Cabinet Office in that year would be the next best figure. Chris Prom  quotes statistics from Radicati  stating that on average a business user sends 33 emails a day. I recently spoke to an organisation who had a reasonably good electronic records management system, no fear of Freedom of Information, and a strong commitment to record keeping. They told me that the number of items contributed to their records system equated to one item per member of staff every two days. If the figures Prom quotes are correct that would give a ration of around 1 email saved to their records system for every emails 66 sent. That is several orders of magnitutude better than the State Department’s ratio, but for an important organisation that ratio is still nowhere near high enough to function as a useable and defensible correspondence record. Most UK government bodies operate routine deletion policies, albeit significantly less drastic than the Cabinet Office’s 90 day deletion. Rather than a 90 day deletion it is more common for the deletion to occur 1 or 2 years after the email is sent, or six months to a year after the individual email account holder has left employment. Alternatively or additionally some departments operate a limit on email box size rather than an automatic deletion. Individuals in such departments do not experience the inconveniences reported by Cabinet Office staff. They are cushioned from the impact of the deletions, but the net result is the same. The correspondence record being kept is inadequate and cannot support basic succession planning/staff handover in the short term, corporate memory in the medium term and historical accountability in the long term.